KIT-GIK-Studium und Lehre - Studien- und Abschlussarbeiten - Diplomarbeiten - Determination and Validation of GPS based Slant Water Vapor Values. Determination and Validation of GPS based Slant Water Vapor Values. The objectives of this work are the determination of the components of the atmospheric slant water vapor delay and the creation and interpretation of site-specific water vapor plots. The signals of the Global Positioning System (GPS) are affected by refraction due to their propagation through the ionosphere and the neutral atmosphere. The first order refractive delay caused by the ionosphere can be corrected using dual frequency GPS observations. In contrast, the modelling of the refractive delay caused by the neutrosphere is difficult due to the density increase of the atmosphere with diminishing altitude [Bauer 2003]. Because of the different behavior in the neutral atmosphere it is convenient to separate the neutrospheric delay into a wet and a dry component. About 90 percent of the neutrospheric delay is caused by the dry component [Jock et al. 1997]. This component one can easlyly and precisly model because dry air is well mixed and variations are mostly slow and smooth. Based on the assumption of the hydrostatic equilibrium and the fact that the refractivity of dry air is almost perfectly proportional to density [Linfield et al. 1997], the dry neutrospheric delay can be computed using surface meteorological measurements or meteorological information [Braun et al. 2000]. Computing the wet neutrospheric delay is difficult because the water vapor is strongly inhomogeneous in time and space. This work deals with the determination of the wet neutrospheric delay caused by water vapor. 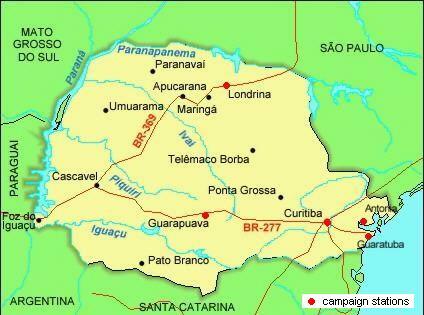 Two 48 hours GPS campaigns were carried out in the Brazilian Federal State of Paraná and data were collected at three different sites in each campaign (cp. Figure 01). The sites were located at different altitudes in order to detect a possible influence of the site altitude on the total wet neutrospheric delay. The first measurement was made in July 2004 and the second in September 2004, so seasonal variations might also be noticed. All recorded data was processed with the Bernese GPS Software 4.2 and the site specific water vapor plots were created with Matlab 6.5. The determination of the atmospheric water vapor with a reasonable spatial and temporal resolution is very important fpr geodetic applications as well as for other earth sciences (e.g. meteorology). GPS measurements permit to estimate the integrated amount of precipitable water along the line-of-sight between the ground-based receiver and the GPS satellite, this value is usually called “slant water” [Braun and Rocken 2002]. The slant water vapor value consists of two components, an so-called isotropic a priori model value and a so-called non-isotropic residual. The isotropic component was determined in two steps: At first the zenith precipitable water vapor was computed with the a priori Saastamoinen model. Afterwards the Niell mapping function was used to relate the zenith precipitable water value to the elevation angle of a specific satellite in relation to the concerning observation site. Only the wet part of the Saastamoinen model was calculated in dependence of the elevation using analytical formulas for humidity, temperature and atmospheric pressure. In the second step the wet corrections of the site-specific troposphere parameters, obtained from the processing of the GPS observations with the Bernese GPS Software 4.2, were computed with the help of the Niell mapping function. Generally high accuracy GPS applications use double-differences to adjust satellite and receiver clock errors and to mitigate other error sources, but double differences are more difficult to interpret than pure path delays, since four different lines-of-sight between the two satellites and the two ground-based receivers are involved [Braun et al. 2000]. Therefore a method was applied to extract the residual line-of-sight water vapor delays from GPS double difference residuals. This procedure is based on a transformation of double to single differences and another transformation of single difference to zero difference residuals; uniqueness is provided by some additional postulates in the form of condition equations. The resulting zero differences still contain effects like the unmodelled atmospheric delay, antenna phase center variations and site multipath effects [Braun et al. 2001] but in this work it is assumed that the single path delays are free of such errors. So the non-isotropic component is represented by the zero difference residuals. It is also assumed that the delay caused by the dry atmosphere can be removed from the residuals due to a proper modeling in the Bernese GPS Software 4.2. So the total wet neutrospheric delay for each site is obtained by calculating the sum of the isotropic and non-isotropic components. The results of this work show for example that the neutrospheric wet delay is dependent on the site altitude and on the elevation angle. A low elevation results in higher values for the total wet neutrospheric delay and a rising elevation diminishes the total wet delay. This may be explained by the fact that at low elevation angles the way of the signal through the atmosphere is longer. Another dominant influence on the total wet neutrospheric delay has the site altitude (Rizos 1999) due to the inhomogeneous composition of the atmosphere and the spatial and temporal variation of water vapor. The site altitudes of the six stations in the Federal State of Paraná differed between 2 m and 1053 m above sea level. The comparison of all stations points out that there exists a significantly smaller neutrospheric delay at high altitude than at sea level. Unfortunately, due to the short observation time it is impossible to make any statement about daily or seasonable fluctuations in the wet delay caused by the spatial and temporal variation of the atmosphere. This work was done at the Federal University of Paraná, Brazil, within the scope of an academics exchange between the University of Karlsruhe (TH) and the Federal University of Paraná at Curitiba.